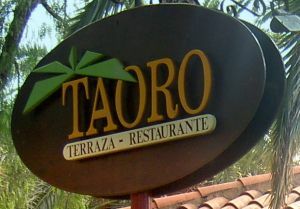 Taoro Restaurant should be part of a special day while on holiday in Tenerife. Taoro Restaurant alias Restaurante Terraza by that name is located in the cooler heights above Puerto de la Cruz. 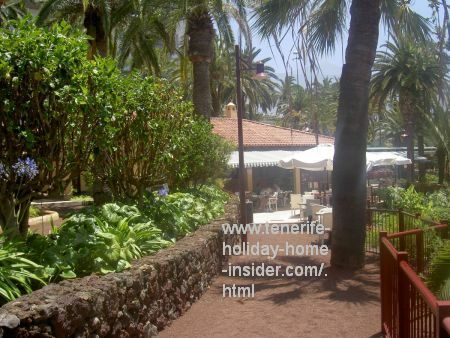 It is a must to go to when on holiday in Tenerife. The next picture shows the beautiful fountain that is only a few meters from the restaurant. The live water display is complemented by a bowl of huge, green elephant ear plants. Tall palms are all around the spring as well as the restaurant. 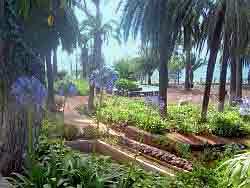 Turn right by the water feature and reach the Restaurante Terraza Taoro within a few meters. The Mirador is a large area with yet another fountain. It has benches for resting, many flowers and mature trees. 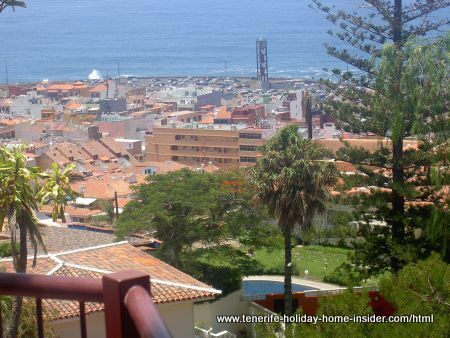 There are several best view points toward Puerto de la Cruz. 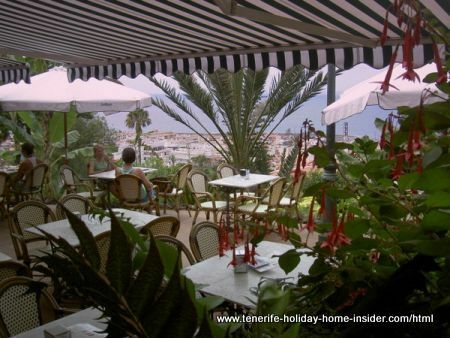 Taoro garden terrace for eating out in Tenerife. The venerable building of the former hotel and then casino Taoro of the oldest Tenerife resort is a further ten meters above it all. This building is towering over the town. It may often be seen from far away. 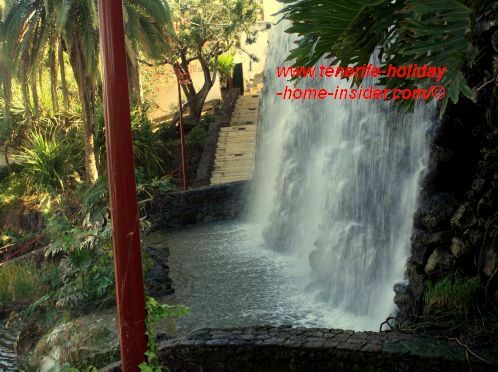 You will not find such an exceptional stimulating park like that by the Taoro Restaurant away from your holiday home in Tenerife, easily. New management and name change. By the way, this restaurant has been under new management by young people since 2013. It is now called Terraza Taoro and has a small Spanish homepage by that name. 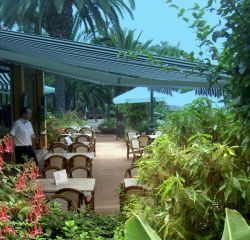 Encounter some detailed directions with a couple of photos for reaching this exquisite garden restaurant Taoro of north Tenerife from the center of Puerto de la Cruz. 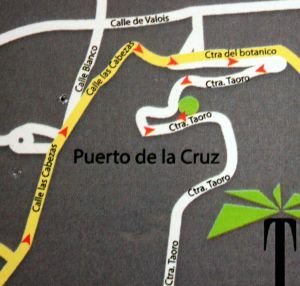 Its street address is Ctra El Taoro,9, 38400 Puerto de la Cruz. Eating out place at Taoro. Detect the Taoro Restaurant in the photo with a bush of red flowers and abundant shrubs on the right. All is flanking the tables. A true garden restaurant, indeed. Enjoy the lushness of a plant paradise while you take a meal or the smallest refreshment at the Taoro Restaurant. Listen to the sound of falling waters which reach you from beyond the Mirador. The bar is open towards the patio. This is where we settled. Actually, we stumbled upon this place when we came back after our sumptous cake with cream topped coffee for €5 at the Bello Risco waterpark . This time, we planned to have just one more coffee, one more little Spanish expreso. Doris admired the blue Agapanthus flowers when we walked in. She also loved the gentle noise that came from the springs. I absolutely adored the bed of yellow lilies in front of the restaurant. But, then, my friend saw the delicious salad on a table next to us. "It's very good", commented the tourist couple. "It's part of the daily menu", the man added. "Look, it's advertised on a board there." It read: "Menu of the day: Grilled fish, baby potatoes, tropical salad, dessert, €8,20." We were not "that" hungry after the cake at Bello Risco. Could there be a more friendly restaurant service? "What about sharing?" my friend said. She knew that I would approach the waiter to ask. We got our one person dish with two plates and, two sets of cutlery. Only the extra wine for one of us had to be paid separate plus, the extra ice cream, of course. I didn't even want it after I had finished my half share of perfect fish and, all the other halves, you now. The portion had been so generous, that we both had plenty enough. Indeed, we had a belayed perfect lunch at night with the most perfect view. I, totally, forgot to take yet one more photo of it. My page is getting endless, anyway. No more picture... Right? "So, when are we coming back here for supper", my friend added smiling. Needless to say that the menu is not the same any more now in 2018. Just check it out anyway... The priceless surroundings of Terraza Taoro which belongs to the Tapas route, by the way, are worth it. At 8 p.m., a young blond lady started singing at the restaurant for the numerous guests. She had a little organ mounted in front of her. She only pretended to play. It didn't matter to us. The music we heard was well synchronized with her lovely voice. Perhaps, the music at Taoro Restaurant is only offered on Sundays and, in high holiday seasons like August. When we left the restaurant and crossed the park area of the look-out we were even more enchanted. The illumination that came from old lamps that are in different locations of the park was too beautiful. 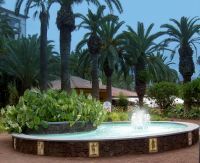 See more photos of the park of Taoro with its wonderful flower filled roads and views over the lower part of the oldest resort on Tenerife Island. 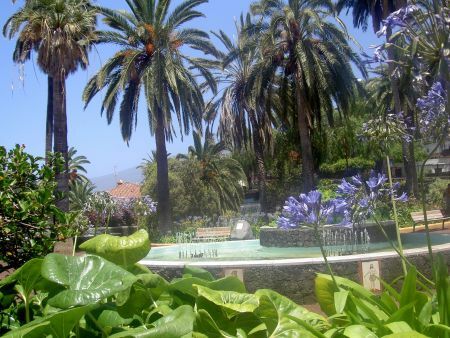 Then, you will understand why my biggest wish would be to have my holiday home in Tenerife at this park. Also, the area reminds me subtropical surroundings of my past where I was very happy.